Last month, I spent hours wandering around the Hoodoos (an area of fantastical rock formations south of Mammoth Hot Springs) in Yellowstone in search of my favorite little alpine dweller, the pika. Pikas are small, intrepid lagomorphs that survive in harsh alpine environments and can actually die from overheating. I am always enchanted by watching pikas as they scurry across the rocks carrying grass to cure as hay for winter forage. Although I frequently heard their cheerful chirping during my wanderings, the “rock rabbits” or “boulder bunnies” as they are nicknamed, dashed into their dens too fast for me to catch a good glimpse. 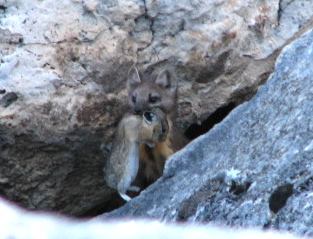 Pine marten and pika in the Hoodoos, Yellowstone (Photos by Jennifer Mast)A sighting of either a pine marten or a pika alone is enough for calling it a day—so discovering a pine marten carrying its recently killed meal of a pika rates high on the “pretty rare and darn lucky” wildlife watching scale. Pine martens, a member of the weasel family, are adept climbers who usually prey upon squirrels and chipmunks. Well-camouflaged and extremely fast, martens are difficult to view in the wild. Likewise the pika, as its grey color blends in well with the boulder fields the animal calls home. Warming temperatures from climate change have threatened the pika in many areas. In the Sierra Nevada, the pika is moving up the mountains trying to escape the heat and will eventually run out of range. Studies in the Great Basin have shown the pika disappearing from prime habitat in just a decade. For more information read my past blog entry: A Plea for the Pika.